Olive oil samples with range of sediment. Left to right least amount of sediment to most amount of sediment. Olive oil is produced by grinding whole olives and extracting the oil by mechanical or chemical means. Olive oil has a wide variety of applications cosmetics, pharmaceuticals, soaps, but most commonly is used in cooking. Can HunterLab instruments accurately determine the quality of olive oils quantitatively? The olive oils pictured above had previously been visually inspected to determine quality. However, visual evaluation is not precise enough to consistently predict the quality of the product. Based on this instrumental measurements were investigated for the oils. 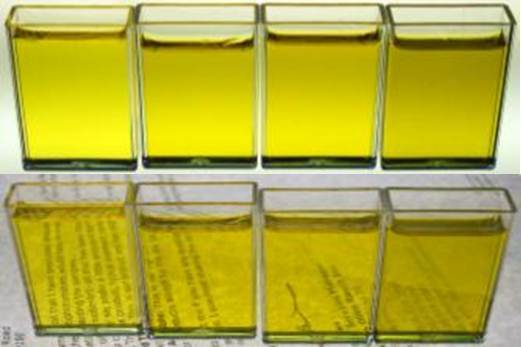 The particular producer of the oils pictured above producer determines the quality of the oils based on how much sediment is in the end product. The lower quality olive oil (pictured on the far left) has been filtered and has virtually no sediment in it. The higher quality ideal product has a slight amount of sediment in it to give it a balanced flavor (middle two in the picture above. )The olive oil pictured on the far right above has a large amount of sediment in it; this is not ideal for most cases but does have its uses so it is necessary to be able to quantify the degree of sediment in it. HunterLab was able to use our ColorQuest XE instrument to quantitatively determine the amount of sediment in the olive oils pictured above. The amount of sediment in the olive oil is related to the haze percentage of each sample. Lower levels of haze indicate less sediment and higher levels of haze indicate a large amount of sediment. Using a sphere instrument with the ability to measure haze HunterLab was able to provide instrumental measurements that correlate to the visual assessment of the olive oils.